Short Lincoln Drape Lamp in purple Amethyst is the newest color of Short Lincoln Drape from Aladdin. The Short Lincoln Drape lamp has been a staple in the Aladdin line since its introduction in 1939! This lamp offers the best of form, function, and economy. 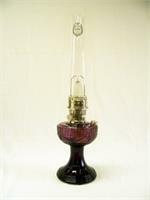 The glass bowl of this Short Lincoln Drape Lamp allows for you to easily monitor the fuel level. This Short Lincoln Drape Table Lamp comes with nickel-plated solid brass hardware with a durable laquered finish. Includes a fill cap for easy refilling. Holds 1 quart of kerosene. 24" overall height. The 10" glass shade features hand-painted flowers in purples and greens. The shade is a combination of frosed and clear glass to allow for maximum light out put while still producing a warm glow.